I was standing behind a superhero. He was four feet tall and could barely see over the counter. “I like shrimp in my bowl,” he told the server at PokeHub. His mom suggested he try kale, but the superhero refused. “I’ll take seaweed,” he said. His mother looked pleased. Maybe you love it. Maybe you haven’t tried it yet, but one thing to know about Poke (pronounced Poh-Keh) is this healthful bowl of ingredients is like a taste of the tropics in a bowl. Poke’s origins are distinctly Hawaiian. The islanders have eaten some form of it for centuries. The pre-Colonial seafood dish literally means “to cut crosswise into pieces.” They prepared their fresh catch of the day—usually octopus or small reef fish—by slicing, salting and then serving it with seaweed. Other additions might be algae and candlenuts—both are indigenous to Hawaii. With the ocean’s bounty on their plate, Hawaiians ate some form of poke on a regular basis. 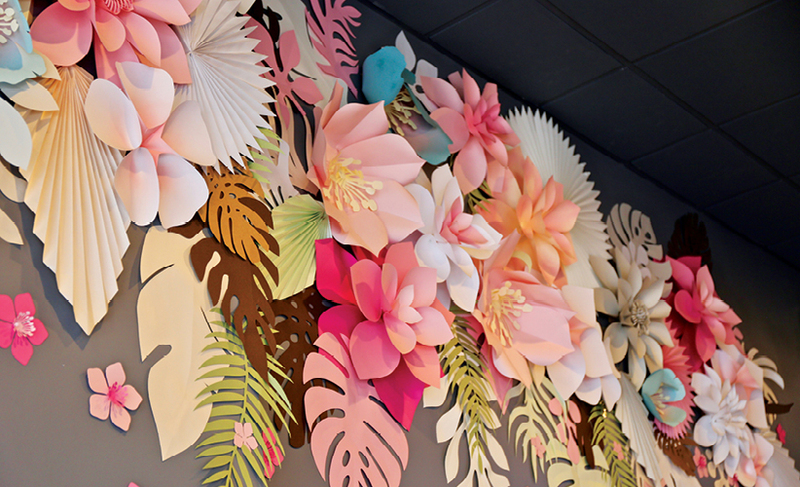 Today, they often choose from 20 different versions of poke at grocery stores, surf shacks and gas stations. Seafood is typically sold by the pound, and rice costs extra. Then they put it in a cardboard box for you to take to the beach, work or home. The classic poke proteins are octopus or raw ahi tuna, marinated for at least one hour in soy and sesame (although today in America, salmon is the most requested). The poke movement in mainland America began on the West Coast, especially coastal cities like San Diego and Los Angeles. Then, poke restaurants began turning up in urban areas around the country. At this writing, Northern Virginia has 11 restaurants dedicated to poke, but you will see poke dishes on restaurant menus as well. 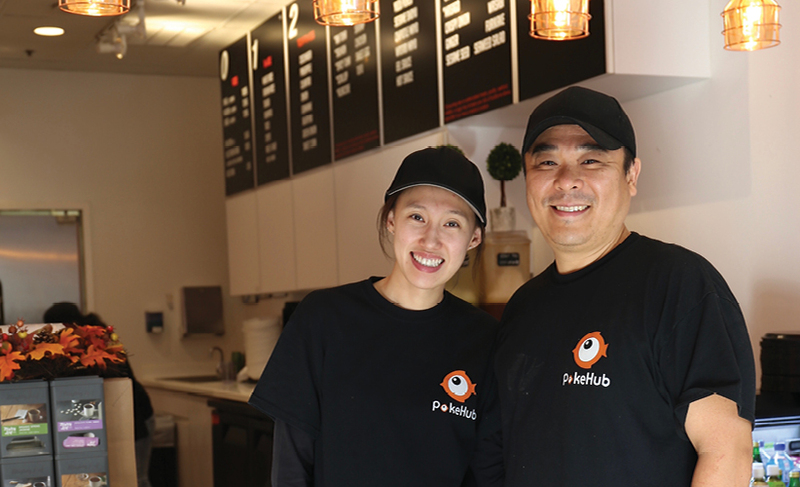 Chloe Lee and her husband Brendan Lee own PokeHub in Reston Town Center. The Lee’s are from Orange County, California, where they had a popular poke restaurant before most East Coast residents had ever heard of poke. 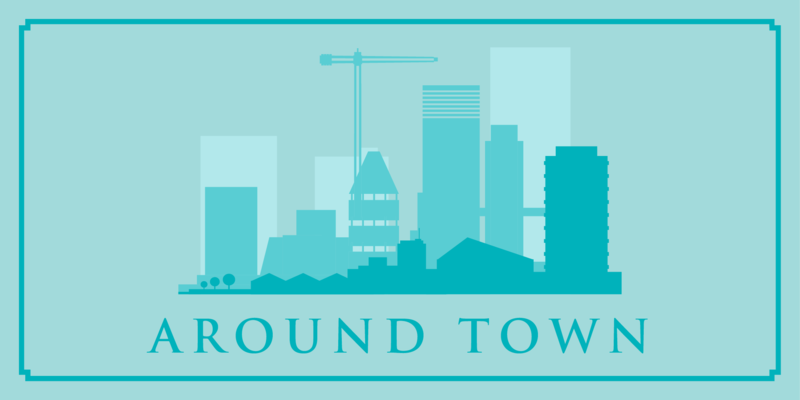 Chloe wanted to live near her mother in Fairfax County, and the Lee’s felt Northern Virginia had excellent schools and was an ideal place to raise their kids. They sold their restaurant in California and opened up PokeHub about 18 months ago. PokeHub is not the typical fast-casual poke place. The Lee’s want people to come in several times a week, so they offer an extensive variety of possibilities for enjoying their poke. You can even have chicken and tofu. For your base, choose from white or brown rice, tortilla chips, salad mixes or a burrito version—your selections are wrapped in seaweed like a sushi roll. There’s even a kid’s bowl, for your superhero. Chloe is a fresh food fanatic, so she prefers to serve her seafood raw, rather than marinated in advance. “I don’t like the seafood to get mealy,” she says. 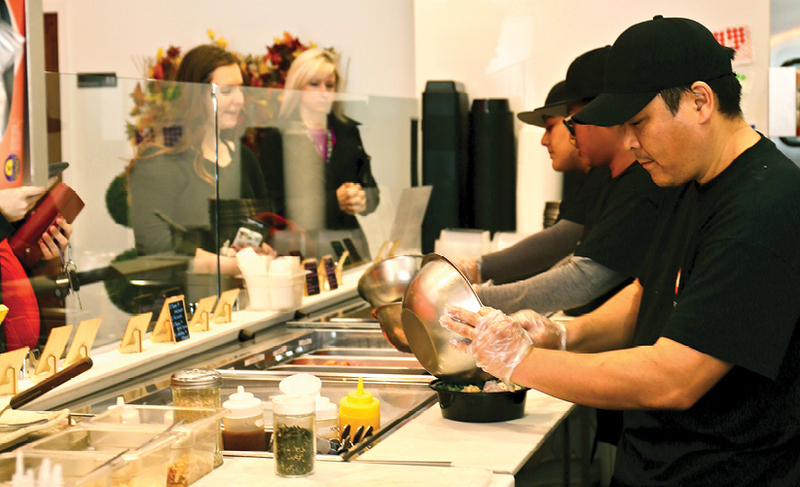 The line staff takes the ingredients you choose for your poke bowl and mixes them together with the sauces of your choice before serving them. PokeHub has far more seafood choices then most poke restaurants. 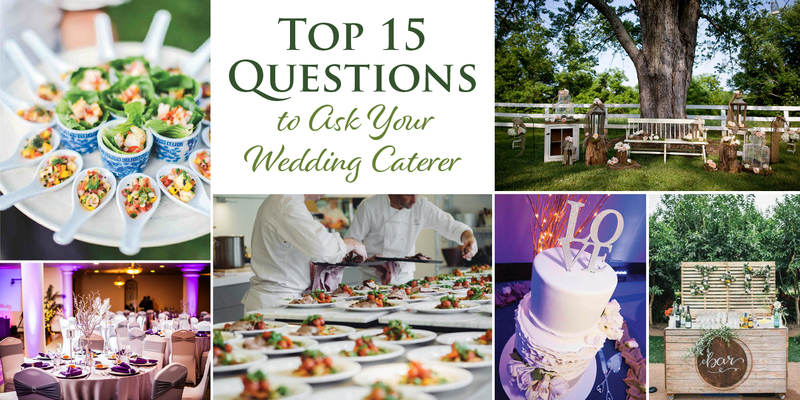 Select from ahi tuna, seared Albacore tuna, salmon, eel, scallops and shrimp. “We cut each fish as needed, so they stay fresh,” says Chloe. I watched them clean up at the end of lunch. Nothing sits, and the kitchen looked immaculate. Chloe says that there are poke places all over California, but only the really good ones survive. She tried to sell the concept of poke to several developers when she first moved to the DC Area, but found them skeptical. 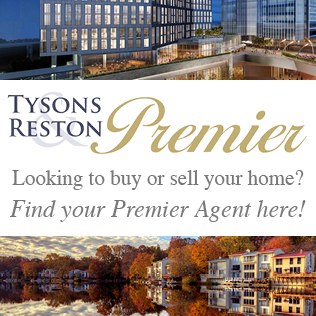 “When we asked the people of Reston Town Center, they were familiar with the product, and agreed,” Chloe says. PokeHub was one of the first in Northern Virginia, and it fits in well with the modern lineup of dining options. 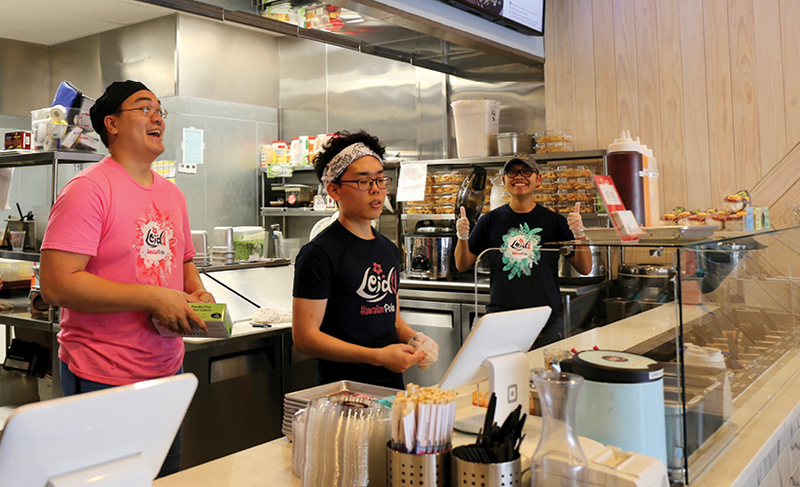 The Lee’s are opening additional locations in Oakton and near the Capital One Center. A wide variety of toppings awaits diners at PokeHub. I adored the pickled cucumbers and the Masago (fish eggs), sweet crab, wasabi and furikake—a combination of dried seaweed, sesame seeds and dried fish. Several of these ingredients cost extra, so don’t add them haphazardly. I tried the traditional sauce—Yuzu Ponzo and Sesame Shuyu, but spice-lovers might prefer the wasabi mayo or PokeHub’s custom-blended hot sauce. “We make all our sauces in house,” Chloe adds. 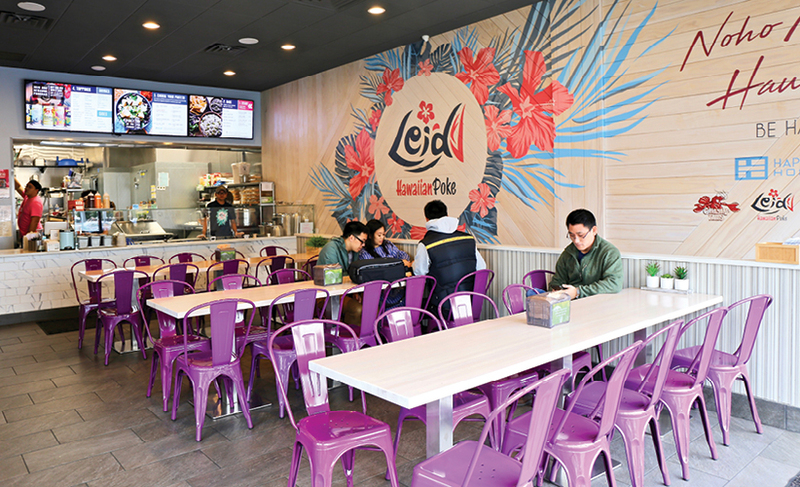 On another afternoon, I stopped at Lei’d Hawaiian Poke Shop next to Tysons Corner where I found a steady stream of customers. 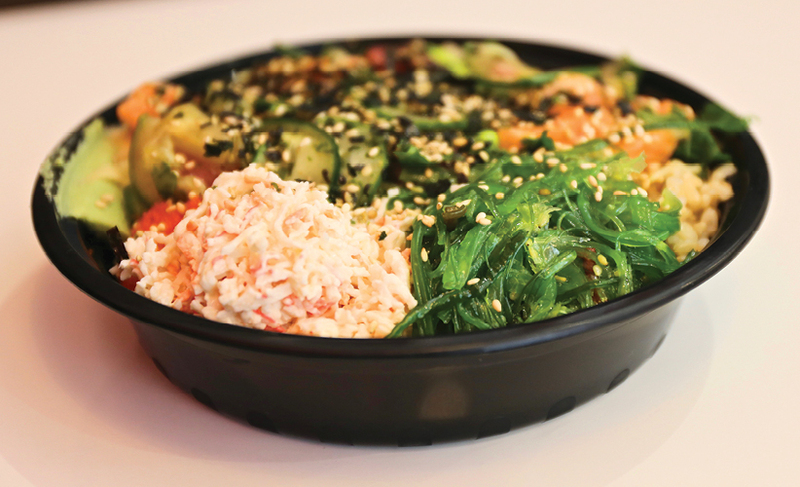 For the base of Lei’d’s poke, choose from white or brown sushi rice, soba noodles, Matcha edamame rice and nachos. Then build your bowl with proteins, either salmon, tuna or shrimp in pre-marinated sauces like Gangnam style, Sea Salt Limu (lime), Red Volcano and some conventional sauces like Siracha or Yuzu. Select a few toppings—I recommend the diced mango and Hot Cheeto Crunch. There are lots of combinations, but sometimes too many toppings can obscure the star of the dish—raw fish. But I’ll leave that to you to decide. With its growing popularity, Hawaiians are enjoying the enthusiasm for their regional dish, but some experts worry about the sustainability of featuring fish at a fast-casual restaurant. And although it’s not customary to add pineapple and avocado, it makes your bowl look infinitely more Instagrammable. Hawaiians like to say the poke we eat in the U.S. is California Poke, not Hawaiian Poke. Either way, this healthy, flavorful meal in a bowl just might make you feel like a superhero.